One of the most common questions I get asked typically goes something like this: “We are planning a trip to Arizona and Utah and want to hit up some National Parks. Where do we start?” Getting these types of questions is no surprise. 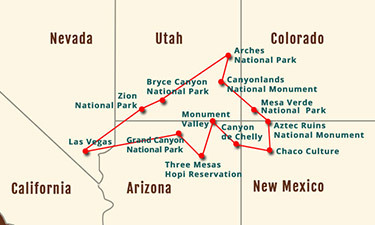 Some of the most iconic sites in the National Park system center around that area of the country. And while you can spend a full week at each and every one of these parks, you may want to get a sampler plate for your first go around. So I decided to write a series of posts to keep all the important info in one place. In this first part of the series I am going to talk about the area and sprinkle in some tips along the process. You may hear people talking about this area of the United States in a variety of ways. Basically, they all mean the same thing. The Colorado Plateau is the geological term for this area and why the Grand Circle of Parks are grouped together. The Colorado Plateau spans the across 130,000 square miles roughly centered around the four corner states. While most people will not say they wish to visit the Colorado Plateau, it should be noted that seeing multiple National Parks within this region gives you a great experience to see the diversity in wildlife, vegetation, and landscapes within this common region. Many people refer to this are as the “Four Corner States”. This is a mostly correct term. The majority of these National Parks center around four U.S. States that each have a corner that matches up: Utah, Colorado, New Mexico, and Arizona. But technically, this area also includes areas of Nevada AND when people think of Colorado, they typically think of the Rocky Mountains which are equally majestic but not part of this region. I feel it important to note that even though the Four Corners Monument, a place where you can literally touch all four states at the same time, is worth visiting, it is not part of the National Park system. It is owned and operated by the Navajo Nation Parks and Recreation Department, and, sorry to be the bearer of bad news, isn’t really actually at the point where the 4 states meet. That is really (technically) 1,807 feet East of the location. For most people, The Grand Canyon is the keystone to their trip itinerary and there is very little debate why. The Grand Canyon is one of the Seven Natural Wonders of the World and is truly awe-inspiring and breathtaking. Any trip to the area, whether you’ve visited before or not, should include a trip to the Grand Canyon. Because of this, I tend to ask specific questions about what people hope to achieve there and then build out an itinerary around that. For example: If you would like to see a few things and take some pictures you could do it in one full day on the South Rim but probably should dedicate 2 full days. But if you wish to take a mule ride to the canyon floor, or watch the sunset from Havasu Falls you’ll want a few extra days (and time to obtain the hiking trail permit). The Grand Canyon National Park has land, Visitor Centers, and areas of interest on both the South and North Rims of the canyon. The North Rim is closed during Winter months but when visiting during the Summer, understanding which or both rims you’d like to experience will greatly influence your trip planning as well. There are many unique geological features of this area of the country. The most common geological feature found in the Colorado Plateau are in the “lithic Layer Cake” formed in the Paleozoic Area from thick layers of limestone, sandstone, siltstone, and shale. This creates the cool horizontal lines of rocks seen in the Grand Canyon. The most popular place at the Grand Canyon to see this feature is at Lookout Studio in the South Rim. Another interesting geological feature is in the area known as “Red Rock Country”. Brightly colored plateaus dot the landscape within this region. In my opinion, the best place to see these formations are in Sedona, Arizona which you will drive through if you head to the Grand Canyon from Phoenix. 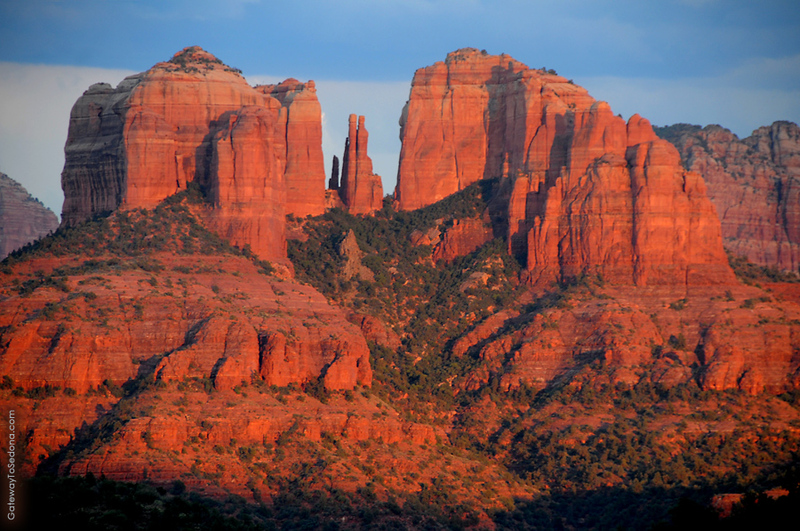 While not part of the National Park Service, parts of Sedona are in the Coconino National Forest and from the main road you can stop at lookout points to see the most famous red rock formations, Cathedral Rock and Bell Rock. Hoodoos are spear like rock formations that shoot out from the ground. Basically, they are formed because there is hard rock on the top of them that serve as caps and protect it from erosion. This creates rock formations that sometime look like a mushroom top or a giant boulder golf ball on top of a rock tee. These can be found all over the area but the absolute best place to see them is definitely Bryce Canyon. Bryce Canyon is known for hoodoos and the National Park has lookout points that really highlight the landscape. Natural Bridges are “rock arches” formed where erosion literally punches a hole through a rock formation. The most famous natural bridge and probably the most famous site in the entire National Park system is the Delicate Arch at Arches National Park. This is THE mandatory thing to see when you are at Arches and if you are able-bodied and have the time, the hike to Delicate Arch is worth the effort. It took us about 5 hours roundtrip but it ranks as the best hike my family has ever taken. Slot Canyons are formed when rivers carve through soft sandstone creating amazing textural canyon walls. This results in beautiful scenery as the sunbeam shoots through to the canyon floor. There are two fantastic examples of slot canyons that you must visit at some point in your life. The first is at a place called Antelope Canyon. While Antelope Canyon is not part of the National Park Service, it is a park in the Navajo Nation Park System and it is the most beautiful example of slot canyon formations in the area. There are limited daily tours available and you must book in advance. But if planning a trip that includes the South Rim of the Grand Canyon, and Mesa Verde or Arches, Antelope Canyon will be on your way. The second beautiful example of a slot canyon in the area is the Narrows at Zion National Park. The Narrows is a moderate hike that requires you to wade through knee to waist height water through the slot canyon. It is worth effort and the time to hike it. Badlands are sedimentary rocks that have been extremely eroded by wind and water creating things that look like rounded mountains. There IS a Badlands National Park in South Dakota but you can also find examples of badlands all over this area. My favorite examples of badlands in this area is at Petrified Forest National Park. Petrified Forest is located on the Eastern side of Arizona, about 200 miles northeast of Phoenix. There is a trail called the Blue Mesa Loop Trail at Petrified Forest that offers stunning views of greyish-blue badlands. Amazing! There are a few viable options when flying into the area to begin your trip to the Grand Circle of National Parks. On our last family trip to the area, we decided to flying and out of Phoenix creating one massive loop driving counter clockwise through 5 states. If places like Sedona and Petrified Forest is in your plans, Phoenix seems to the the best way to go. It offers a path to all the major sites in the area with minimal backtracking. We started north through Sedona and stayed at Flagstaff, Arizona using it as a hub to visit the South Rim of the Grand Canyon, Petrified Forest, and Sunset Crater Volcano. We then drove Eastward towards the Four Corners monument to hit up Antelope Canyon and Mesa Verde eventually ending up in Moab, Utah for Arches and Canyonlands. We continued this circle westward through Bryce Canyon and Zion and then at Vegas, drove South back towards Phoenix. 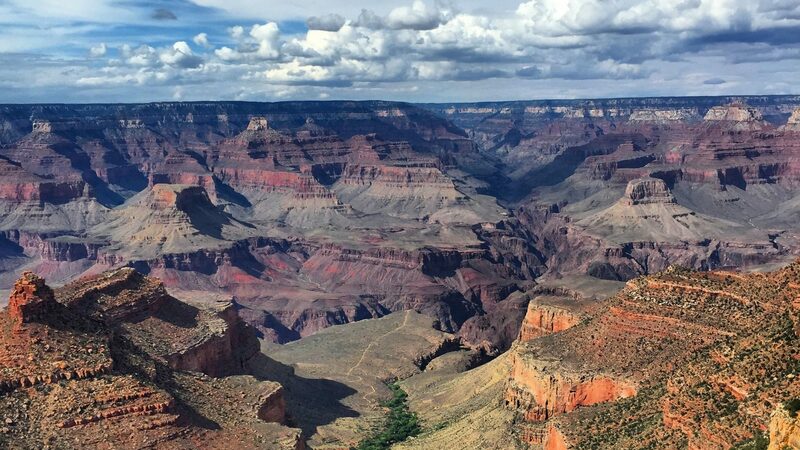 If you are choosing to only hit up the Grand Canyon South Rim, Las Vegas may be your best bet. It’s almost a straight shot Eastward to the South Rim entrance. If you choose to focus only on the Utah parks you could also fly into Las Vegas and start with Zion National Park and head Eastward through Bryce Canyon, Capitol Reef, Canyonlands, and Arches. If you choose to only visit Arches and Canyonlands in Utah, Salt Lake City may be a good option. It is about a 4 hour drive from Salt Lake City and there are great additional sites to see if you choose to just focus on those parks. This area of the country is beautiful but there are things to be aware of when traveling there. • This place is a desert. You need to pack more water and drink more water than you expect. • During monsoon season be aware that flash flooding can occur. This is especially dangerous when visiting slot canyons. • Beware of rattlesnakes and scorpions and never look under rocks. • Arizona does not observe Daylight Savings time but some areas of Arizona are part of the Navajo Nation where Daylight Savings Time is observed. • Mobile phone service is spotty in many areas. • Just because your GPS says it’s less miles doesn’t mean it’s less time. Many roads in this area cut and wind through rock formations causing slow travel times. • When using a camera, remember the area is very dusty. Make sure you protect your lens and bring lens cleaner. This area of the world is one of my absolute favorites. I view the Grand Circle of National Parks the way others view Orlando: many different parks each unique and packed with things to see and enjoy with your family. Below is a video I put together of our trip. If you would like to see the insanely jam-packed itinerary from my family spent 2 weeks in the area in 2015 check it out here!